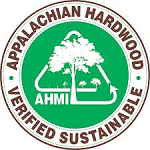 Turman Hardwood Flooring is produced in the Appalachian Mountains of Southwestern Virginia, where some of the best hardwoods in the country are grown. The rich color and grain patterns of the lumber produced from these forests have been used by Appalachian Artisans for centuries to create some of the finest flooring and furniture in the world today. The forests in this region are certified sustainable, which insures that future generations can have the availability of these same materials for generations to come. Our employees are dedicated to manufacturing a quality product at every step of the manufacturing process. Beginning with the tree harvesting all the way to the packaging of the finished product. Our flooring may be used in both residential and commercial applications. Species include Red and White Oak, Hickory and Maple. Wormy Oak may be available by limited special order as well. In addition to our pre-finished flooring and trim, we also stock unfinished flooring. For more information please contact us at (276) 236-9963 or contact a Turman Hardwood Flooring Distributor near you.